Threats of hurricanes swirled near the Hawaiian Islands and as my plane landed, it amounted to very hot and humid conditions but the beauty of Maui was undisturbed. The 5th annual Hawaii Food and Wine Festival was underway and an all-star chef line-up had been created on 3 of the major islands. The islands swirled with music, drink and fabulous food as each island paradise celebrated their bounty. 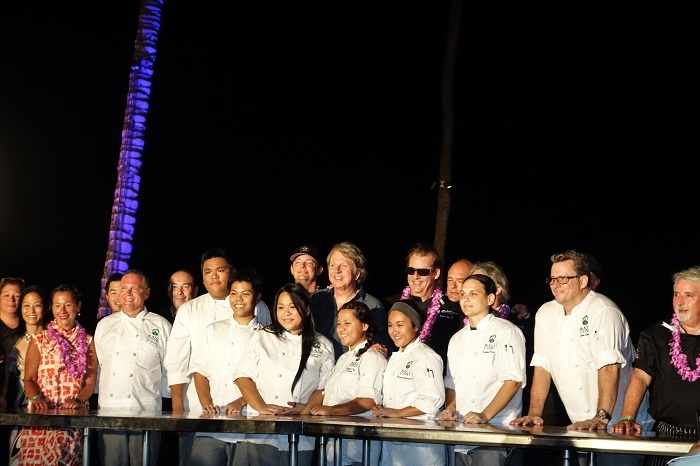 Every year Hawaii’s culinary presence from the land and sea culminates with food and drink prepared by talented chefs. I attended the 2nd annual food and wine festival on Oahu in 2012 and the list of celebrity chefs was like watching the red carpet at the Oscars. Fast forward 3 years and it has expanded significantly with even more chefs and venues. It’s a way to bring many partners together from agriculture, tourism, education and other entities that speak of Hawaii. The state feels so strongly about the festival that it enacted a house resolution supporting the agricultural and culinary festival and referred to it as “Taste our Love for the Land”. Maui, the “valley isle” of the Hawaiian Islands, has mountains, a volcano, and the sea, which creates an array of goods to supply locals and tourists alike. Sure there is poi, papaya, and fish but it’s how these are put together that has changed the food scene. 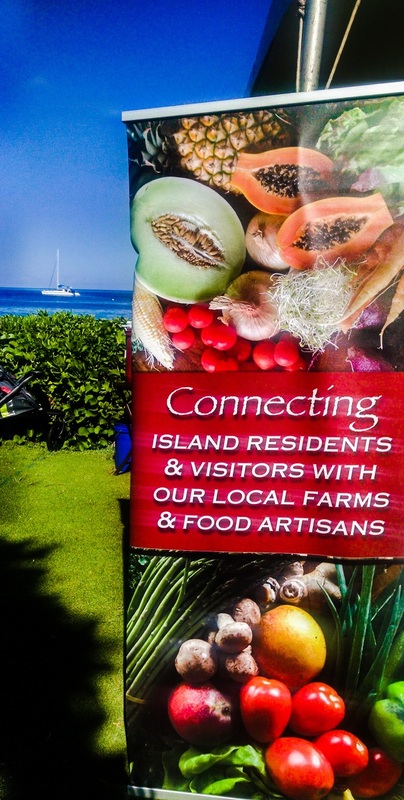 My first event was early Saturday morning and I grabbed my hat and canvas bag and walked along Ka’anapali’s shoreline until I reached the “Grown on Maui” farmers market near Whaler’s Village. Tables with colorful cornucopia displays accentuated the varieties of vegetables, fruits, coffee and eggs produced on Maui. I met Jesse and Roxanne Tiffin, of Kula Fields Farmshop who were busily handing out samples of passion fruit and selling pineapples for $3 from the Kula fields’ co-op. Roxanne was happy to explain about the produce which comes from the upcountry fields of Maui and all the healthy benefits of buying locally grown. With bag in hand, I headed back to the hotel for more adventures. I tried not to be too starstruck as celebrity chefs Nancy Silverton and Celestino Drago arrived and traded their aloha clothing for chef’s jackets. Chef Drago and a few of his team from Drago Centro in Los Angeles holed up in the Hyatt kitchen and made cecaluccoli pasta by hand. While honeymooners sunned poolside drinking mai tais, the daylong pasta rolling yielded 8,000 pillow soft gems just waiting to join simmering puttanesca sauce. The Signature event held at the Hyatt Regency Maui honored the Legend of Shep Gordon. Shep, a former rock star manager, had been the most instrumental person promoting chefs into the newly found Food Network. Emeril Lagasse and Wolfgang Puck to name a few, are grateful for his active role in raising chefs to a new level. It was the start of the culinary celebrity movement in the early 1990’s which revolutionized the way chefs are seen today. His devotion to the chefs changed the entire food scene on television, products marketed by the chefs and enlisting public loyalty to the chefs. Among these chefs cooking for the event was Dan Fearing from his restaurant Fearing’s. Shep began to manage his culinary career and now he was here to pay tribute to the man who had a major impact on his career. Shep also had a hand in the beginnings of the Hawaii culinary movement and with his ingenuity, the rest is history. Throughout the day, workers set up a platform stage and mini kitchen in the garden for the evening event. Arriving early, chefs and culinary students assembled behind simmering pots and seemed to have the dinner for the large crowd under control. They worked together, concentrating on plating each course with an orchestrated flair as guests took their seats while the sun was setting. Teaching Hawaiian culinary students how to work alongside professional chefs and learn from their techniques is one of the goals of the two-week festival. Not all students can go to the Mainland and the variety of visiting chefs widens the students’ knowledge and is meant to inspire their culinary dreams. You couldn’t ask for a more scenic chef’s table. The President of the Maui pineapple association gave the blessing for the meal and all the festival stands for throughout of Hawaii. Six courses were served: Smoked Kona abalone with kabocha squash and Surfing goat cheese with Okinawa spinach and herbs (Chef Gregory Grohowski, Hyatt Maui); wild caught Ama Ebi with ceccalucali puttanesca (Chef Celestino Drago, Drago restaurant group); wild caught big eye ahi Nicoise tartare with cucumber, haricot vert and grape tomato (Chef Mark Tarbell, Tarbell’s Restaurant); Pit BBQ Nihau lamb with slow roasted eggplant and red chile curry sauce (Chef Robert Del Grand, RDG + Bar Annie); BBQ Kalua wild boar tacos, smoked tomatillo with mango and pickled red onion salad, spiced macadamia nuts (Chef Dan Fearing, Fearing’s Restaurant); Torta Della Nonna, Hawaiian Island goat cheese and Naked Cow goat cheese, pine nuts and honey (Chef Nancy Silverton and Dahlia Narvaez, Mozza Restaurant Group). Lots of wine pairings were poured with each course. As the evening wrapped up, I talked with Chefs Wong and Yamaguchi who worked tirelessly throughout the evening and obviously loved every minute of it. Co-founder and co-chair of the event, Chef Alan Wong told me one of the reasons for the festival is to make people aware about the foods of Hawaii which are more than spam and pineapple. Not to mention, that big misnomer “Hawaiian pizza”, making it that much harder to overcome preconceived notions about their foods. Chef Wong has an innate love for the land and the more he and others share their purposeful mission, more of the festivals’ goals are achieved. He said the visiting chefs reconnect with other chefs and experience the aloha spirit to take back to their kitchens. 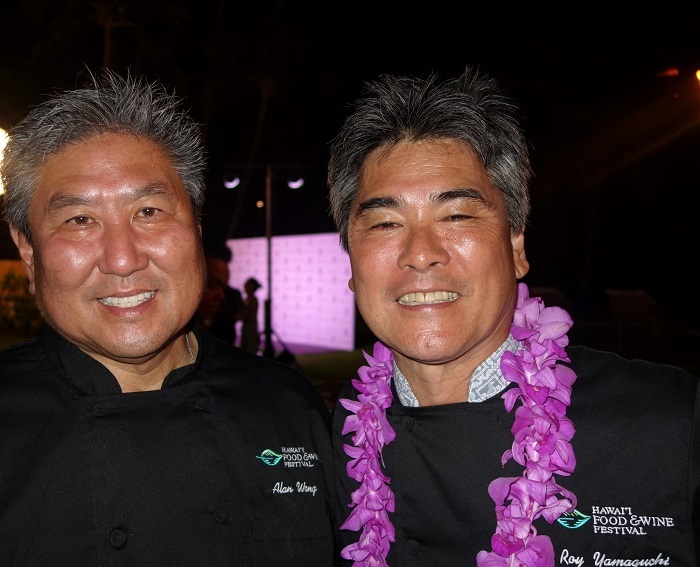 Chef Roy Yamaguchi, the other co-founder and co-chair, has significantly widened his vision about the event since its humble beginnings 25 years ago. Both chefs, along with 10 other distinguished chefs began the Hawaii Regional Cuisine movement in 1991 to raise awareness about their foods. 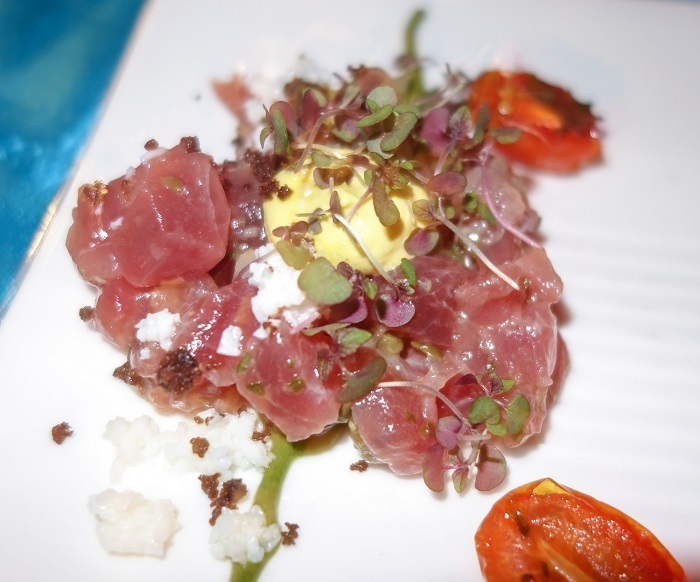 Through the years, it evolved into the current Hawaii Food and Wine Festival. Time had come to bring in other chefs from the Mainland and train the next generation of up and coming culinary students. Chef Yamaguchi desires the continually growing event to showcase Hawaiian food, farms and products by enlisting visiting chefs to become culinary ambassadors. The over-arching goal is for chefs’ to tell the Hawaii story by using the products and recipes in their own restaurants. International chefs will be added in the future as they seek the next step of a global influence. People attending will enjoy the vibrant hospitality and be able to share the Hawaii story with others. Chef Yamaguchi is passionate not only about Hawaii’s world-class ingredients but also about the positive collaborative community immersion. Executive Director of the Hawaii Food and Wine Festival, Denise Yamaguchi, expounded on this. Chefs returning home enthusiastically share the aspects about Hawaii such as the culture, people, and natural surroundings. Combined, it makes for a large tourist market for all the islands. And year after year, many of the chefs order Hawaii products for their restaurants. A very important factor beside fabulous food is the many local groups which benefit from the proceeds. Sizeable donations have occurred to culinary arts programs, seafood council, agricultural foundation, farm bureau and zoo conservation society and more. I asked the humble Shep what he thought about the evening as he walked among the guests extending greetings and he said, “great”. As it has been well said, come to Hawaii not just for the beauty but as a culinary destination.